Did a doctor, nurse, technician, department, housekeeper, volunteer or other caregiver at LifeBridge Health make a difference in your care? If so, you can recognize that special person by making a donation in his or her honor through our Champions of Care program. It's an enduring way to show your appreciation while helping others. We will present your Champion of Care with a beautiful pin to wear with pride as well as an acknowledgement letter signed by the president of the hospital, departments or groups will receive a certificate. The champions will also receive a personalized card on your behalf to inform the individual or family of your gift. Our caregivers count it among the most treasured of honors. Your gift, of $25 or more, helps us change and save lives. It helps us give the best care available to everyone who walks through our doors, regardless of ability to pay. See the list of 2016-2017 caregivers, staff and volunteers who have been honored by their patients for providing exceptional care. When a caregiver is recognized 3 or more times they will be offered the opportunity to be featured on our posters. 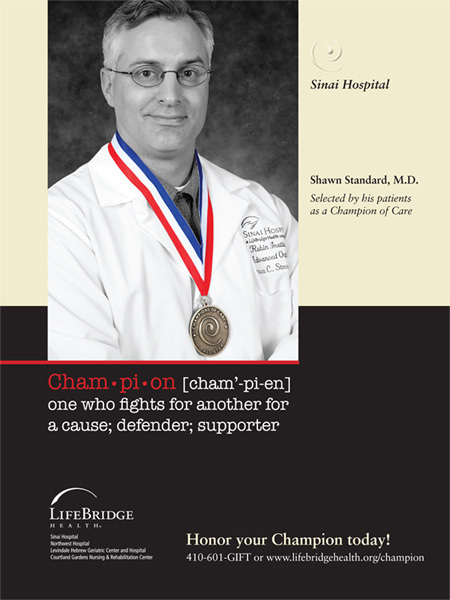 Click here to honor your Champion of Care with a secure online gift. Please note that you will be unable to make an online donation or other online transaction after March 15, 2018 without ensuring that your operating system and internet browser are fully up-to-date. This is an industry-wide requirement to ensure the highest level of security when processing all financial transactions. To learn if your operating system is compatible, please visit: https://www.blackbaud.com/security/pci-compliance/upgrade/os-browsers.